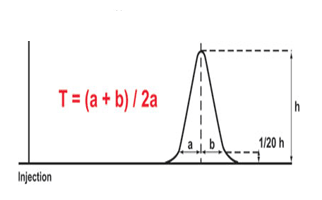 Column efficiency, indicated as the number of theoretical plates per column, is calculated as N = 5.54 (tR / w0.5)2 where tR is the retention time of the analyte of interest and w0.5 the width of the peak at half height. 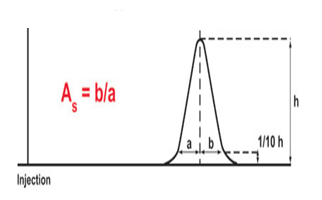 This half-height method enables the determination of the number of theoretical plates per column (N) even if the peak is not fully separated from a neighbouring peak (poor resolution), as long as the valley between the peaks is lower than the half-height of the peak. Half-height measurements commonly is the method of choice for automatic determination by data systems. Tailing Factor (Tf) is the USP coefficient of the peak symmetry. It is calculated using the following equation: Tf = (a+b)/2a where a is the distance from the leading edge of the peak to the peak midpoint (perpendicular from the peak highest point) measured at 5% of peak height and b is the distance from the peak midpoint (perpendicular from the peak highest point) to the trailing edge of the peak measured at 5% of peak height. Since nearly every peak shows some degree of tailing, so to allow for a small amount of tailing and still retain a bit of flat baseline between the peaks, Rs ≥ 2.0 generally is desired for proper resolution between 2 peaks of interest. 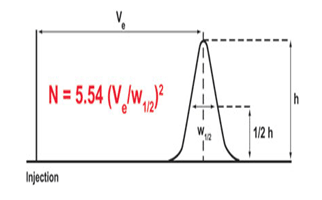 This equation is extremely convenient and gives good results for peak resolution calculations, but it is only useful when the peaks are resolved at baseline level. However, we are often confronted to situation where peaks are marginally separated. Peaks overlap at the bottom, and measurement of the peak width at baseline is virtually impossible. where w0.5,1 and w0.5,2 are the peak widths measured at half the peak height. Note that the factor of 1.7 is added to the denominator to adjust for the difference in width at the half-height. The half-height technique is the way many data systems measure resolution, because it is simpler to measure than the baseline width. The number of theoretical plates per column (performance)/symmetry factor/Tailing Factor/Resolution can and will change depending on the type of analysis and analytical conditions used.